That’s the way I’d like to describe the coffees I got from Espresso Lab, Cape Town, when I visited a few weeks ago. Of course I drank them a while back, but these are just my notes on my experience. Actually, Espresso Lab describe their espresso blend as “a complex blend bringing out blackcurrant licorice and chocolate flavours with a snappy finish”, so I’m just agreeing with them. There’s no doubt it had a complex taste and I really got to taste the chocolate flavours with a snappy finish, but I can’t vouch for the blackcurrant one. In any case, the espresso blend consists of arabic beans from Brazil, Costa Rica and Ethiopia, so it really is a blend, mixing three different regions. Yes ! Costa Rica is not in South America, but in Central America. 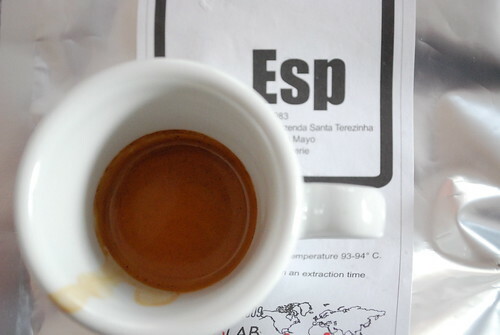 For me, it still confirms that I really enjoy an espresso blend when it has Brazilian arabica beans added, so I was pleased with the espresso, when I got it right. And on that last note, I want to go back to the word “complex”. Using all the techniques of making espresso including timing the pour, this coffee rarely followed the rules. Yes ! out of a 250g bag, which equates to about 16 cups of coffee for me (I only drink double espressos and that happens twice a day and I am assuming 15g of coffee per double cup – complex isn’t it ? ), and after adjusting for the 30ml of espresso in 25-28 seconds, I only got about 7 good espressos. Of course everytime the pour wasn’t consistent with the rules, I adjusted the settings, then it will work in the morning and not in the afternoon and vice versa, hmmmm ! I guess better luck next time and perhaps a bigger bag of 500g to do lots of tweaking until I get a pour right every other time. So enough of the rambling and on to the other coffee. 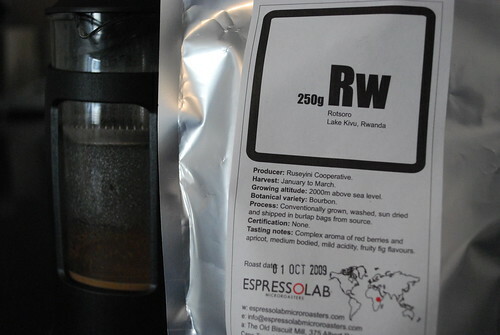 Sometimes it is said “after struggle comes ease” and so it was with their Rwandan blend. Initially, I bought this to satisfy my daily thirst for “real” coffee when I was in Cape Town, extracting it for French Press in the mornings and evenings, however, without proper scales to measure the exact dosage, I just thought “OK ! not bad”, however, on return to Vienna, I got the scales out and made it in my lovely Bodum Colombia and Wow ! what a difference. Who said tools don’t work ? It definitely did on this occasion because it was such a lovely brew and the one word that instantly came to mind was… “REFRESHING”. On tastes, I got the red berries and fruity flavours, which I think really make French press coffee wonderful for the palate. This entry was posted on Tuesday, November 10th, 2009 at 7:22 pm	and tagged with arabica, Brazil, coffee, Rwanda and posted in Bean Talk - Coffees, I'm Drinking. You can follow any responses to this entry through the RSS 2.0 feed.